June 27, 2012, Vancouver, Canada; El Nino Ventures Inc. ("ELN" and the "Company") (TSX.V: ELN; OTCQX:ELNOF Frankfurt: E7Q) is pleased to announce additional high-grade results over significant intervals obtained from holes drilled during its 2012, 18,000 metre drill program at the Murray Brook massive‐sulfide deposit, in the Bathurst Mining Camp of New Brunswick, Canada. The Company has received and confirmed assay results from drill holes MB-2012-90 to MB-2012-101. A complete list of the intercepts from the 2012 drill program is provided in Table 1. The widths of the intercepts are approximate to the true width of the mineralized intercept. The drill program commenced on February 9, 2012 and to date, 97 holes have been successfully completed for a total of 18,467 metres. The entire drill program consists of 164, vertical drill holes; totalling approximately 28,500 m. Figure 1 illustrates the location of 2012 drill holes. Results of the 2012 drill program have been successful in identifying two distinct massive sulfide zones with different mineralogical characteristics and thickness. Western Zone appears thicker and more Zn-Pb- Ag rich and Eastern Zone is thinner and more Cu-Au rich (Figures 2 and 3) illustrates Murray Brook Massive Sulfide thickness at 10 metre contours. A minimum $3 million budget has been proposed for the 2012‐2013 exploration program. The budget includes $2.5 million for diamond drilling work on the Murray Brook deposit and a $500,000 exploration geophysical program on Murray Brook property and the adjacent Camel Back property (Figure 3). The objective of this exploration program is to explore for VMS deposits at depths of up to 200 metres below surface. 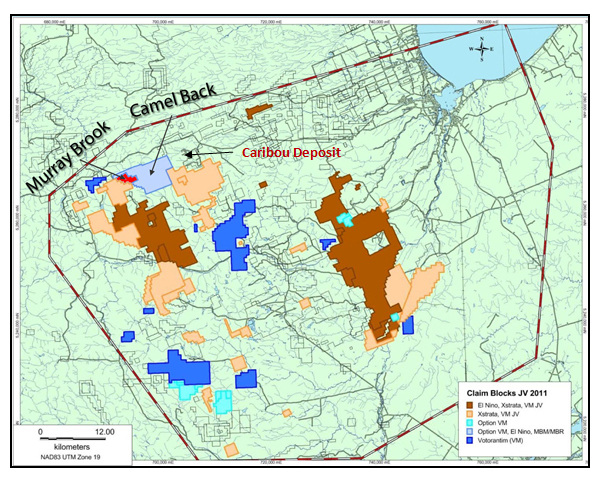 The Camel Back property is located in the area between the Murray Brook deposit to the west, which is the largest open pittable massive sulfide deposit in the Bathurst Mining Camp (BMC), and the Caribou deposit to the east, which is the second largest deposit in the camp with historic resources of some 65 million tonnes. Delineate the outer perimeter of the Murray Brook deposit and advance the resources into the measured (highest confidence) category. Votorantim is the Operator of the Murray Brook Project. 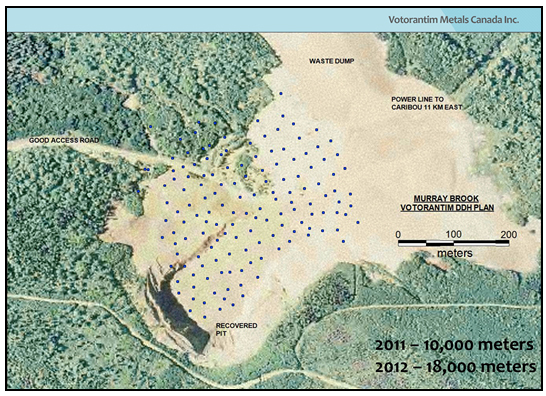 In January 2011, ELN announced that it provided notice to Votorantim to enter into a Participation Agreement on the Murray Brook polymetallic massive sulfide deposit situated in the Bathurst Mining Camp in New Brunswick, Canada. (See news release dated January 20, 2011). On May 10, 2012 ELN announced that Murray Brook Minerals Inc. has been given formal notice by ELN and Votorantim Metals Canada ("Votorantim") of a 50% earned interest in the Murray Brook, polymetalic project, Bathurst, New Brunswick. MBM has also been provided with a valid notice that ELN and Votorantim are exercising their option to acquire and become owner of an additional 20% (for a total of 70%) beneficial interest in the Murray Brook mining claims. This news release has been reviewed and approved for technical content by Ali Hassanalizadeh M.Sc. P.Geo a qualified Person under the provisions of National Instrument 43‐101. Figure 2 - Cross Section of Murray Brook deposit; looking northeast. Consists of an initial 4,712 claims in the Tri‐Party Agreement with Xstrata & Votorantim whereby Votorantim may incur exploration expenditures of $10 million over a period of 5 years to earn a 50% interest. Votorantim may further increase its interest to 70% by spending an additional $10 million over 2 years. 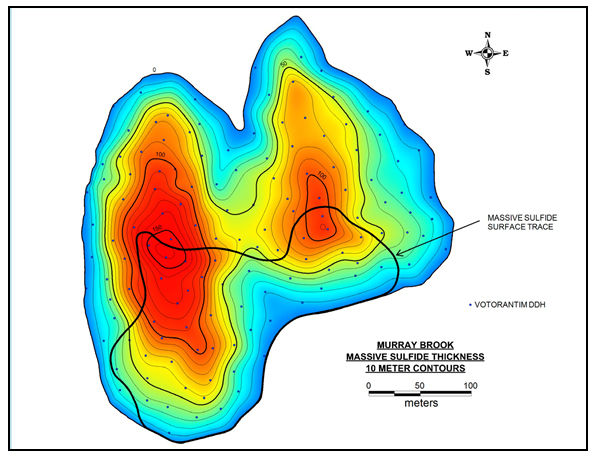 The Murray Brook project, which has an excellent infrastructure, is the largest open-pitable massive sulfide deposits in the Bathurst Mining Camp. 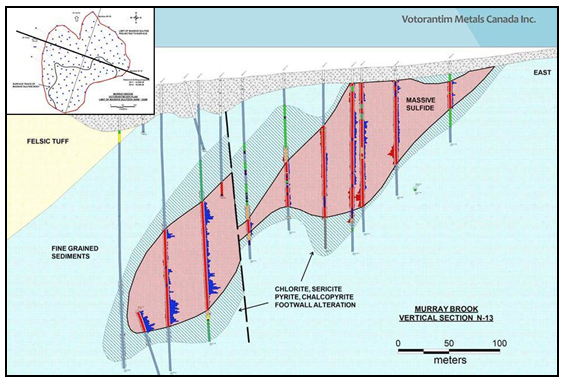 Votorantim can earn up to a 50% interest in the Murray Brook Project by funding $2,250,000 of exploration expenditures over a period of 3 years. Votorantim may acquire a further 20% by incurring an additional $2.5 million in exploration costs over an additional two year period. ELN has elected to participate by paying 50% of Votorantim's exploration costs during the earn-in period. In 2011, ELN and Votorantim spent $2.1 million on exploration; and completed 10,000 metres of drilling. Drill results to date have been encouraging. 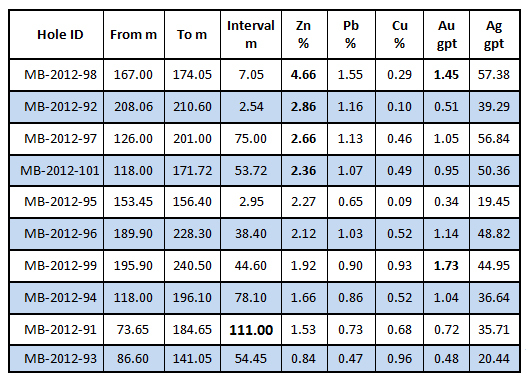 The first NI 43‐101 Mineral Resource Estimate for the Murray Brook Zn‐Cu‐Pb‐Ag‐Au deposit, which includes explanatory footnotes, is presented in the table below (see ELN press release dated February 28, 2012). The resource estimate is based on various assumptions regarding mining methods, processing and metal recoveries, payable metal NSR credits and metal prices. This estimate makes no provision for capital costs to mine the deposit, nor mill the material mined, as resources are not reserves. Murray Brook Minerals Inc. is a privately owned mining exploration company, owner of one of the largest deposit of the Bathurst Mining Camp, (New Brunswick, Canada) the Murray Brook Deposit, as well as of the Camel Back Property consisting of 215 claims. Votorantim Metals Canada Inc. is a subsidiary of Votorantim Metais; a company that is part of the Votorantim Group that was founded in Brazil in 1918 operates in twenty countries and has over forty thousand employees. Votorantim Metais is the largest electrolytic‐nickel producer in Latin America and one of the world's leaders in the production of zinc, aluminum and nickel.